If you crouch, with Down, next to an object on the ground, you'll pick i up. You can't attack when crouching. You can fly all over the screen. The kick is low, but it works out pretty well if a flying enemy likes to hang low. If you hold 1 until his fist glows yellow, then release it, Superman will throw an energy projectile. This may be more useful against bosses that refuse to get close to Superman, but it's not the best option when surrounded by enemies, as it forces him to stay in place. Sometimes you need to, or can, break walls/objects, and they may have crystals within, which will heal Superman if he collects them. There are forced side scrolling sections, and these are when the kicks turn into heat vision lasers. It effectively becomes a shoot 'em up at this point, like in Data East's Captain America and the Avengers. These stages also have their bosses. The charge punch projectile is also here, but you can move around while charging it this time. It's hard to say what works best. The movement of the heat vision lasers may take out smaller projectiles from bosses, but you do need to be in constant movement, so charging a more powerful projectile can hurt them faster. The game basically goes horizontal brawling stage>vertical brawling stage(basically the same exact thing except for how the stages scroll)>horizontal shoot 'em up stage. 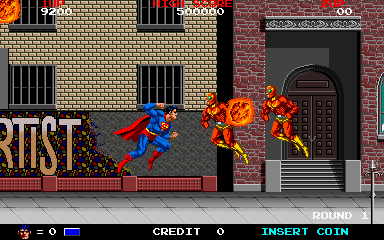 I couldn't tell you if the game was based on any certain Superman property, but the John Williams score from the Christopher Reeves era of Superman movies plays all throughout the horizontal brawler stages. It's a fun, if simple, game, and a good counter argument to those that say there are no good Superman games.